Missouri is the “show me state”, and that’s what this rally feels like to me. 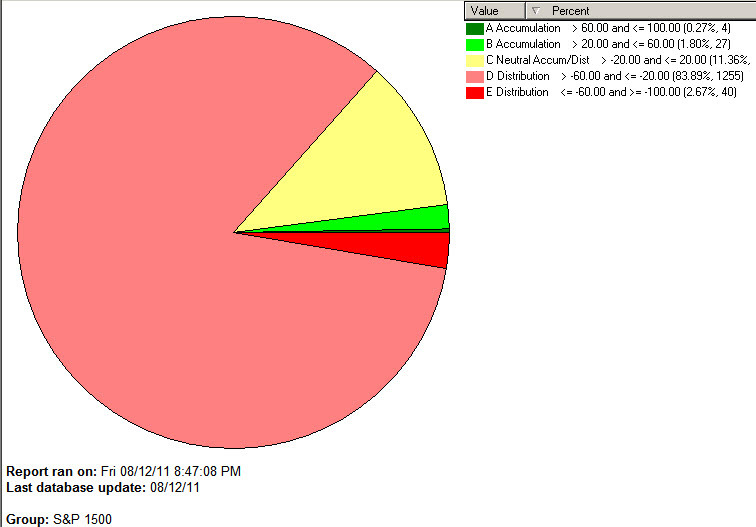 I’m rather busy this weekend, so I’ll use graphs to do the talking. A very sharp price drop, one that typically does not yield an equally sharp recovery (unless a government steps in with major news to support the market; that could happen this weekend in Europe). My major concern is the heavy volume with the heavy drop in prices, then followed by a generally sharp rally in prices but on rather modest volume. It doesn’t look like the big guys are jumping back in. BTW, much of the volume and dramatic price swings this week were (IMHO) caused by short-term, high frequency trading; NOT by investing. 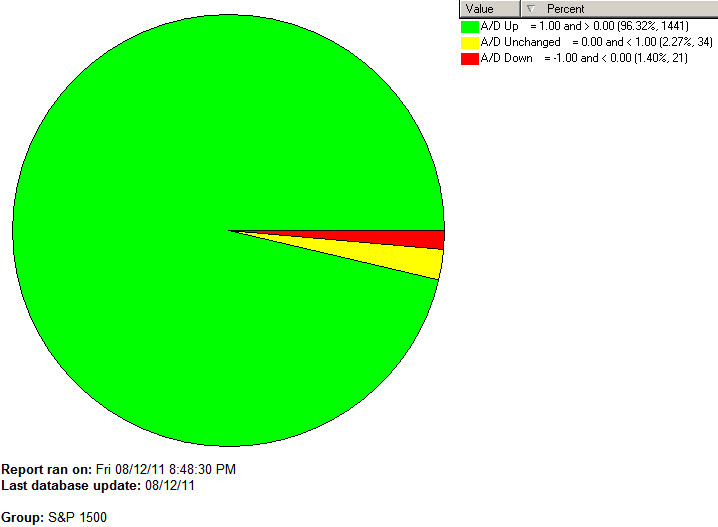 Note there is still a lot of “red” in the pie chart, and not much “green”. Granted it takes a few days for this calculation to reflect status, since it’s more in tune with longer term A/D for investing. I would like to see more Accumulation before I can feel good about re-entry. Much, much more “green” here. The direction is toward Accumulation and that’s a positive sign. But . . . “I’m From Missouri”, show me. 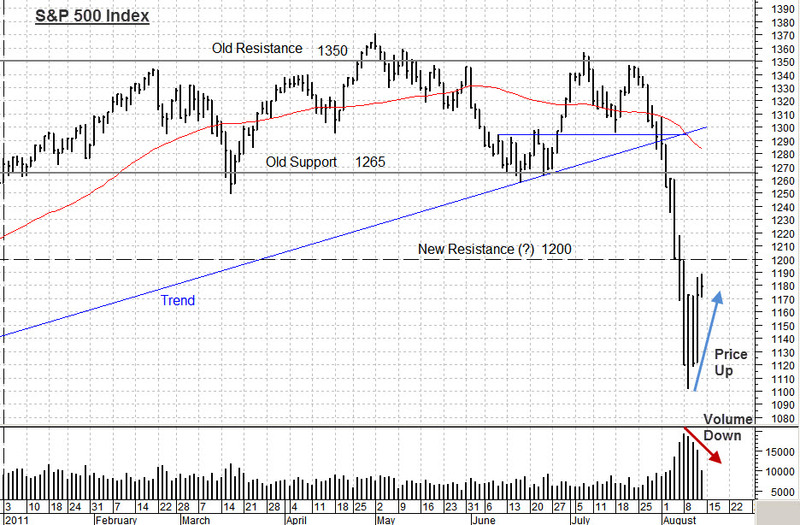 Richard Wyckoff said “Don’t buy the first rally”. What I believe he was saying was to let the market show it’s strength in the form of strong price AND strong volume. I have a composite index made of the top 5 NASDAQ stocks (yes, Apple, Amazon, etc.). If this market is strong I’d expect to see both price and volume confirm it in this composite. So far I’d say it’s improved, but not confirmed. I’m “into patience” right now. Have a great week and post comments as you wish via the section at the top of this posting. Comments & ideas are always Welcome. Cheers !